This is perfect for those cold wintery days. Too bad we don't have many of those here in Florida, but then again... 60 degrees is cold for me. I think I have just gotten used to the hot and muggy weather all these years. On those cold days, nothing beats a hot bowl of steaming soup. 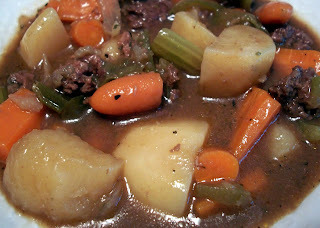 I love beef stew and I love this recipe. The only change I made was add a little more beef broth because I like my beef stew really soupy so I can soak up the liquid with a piece of bread. This turned out to be a great recipe from http://www.allrecipes.com/. I was expecting it to be higher in points, but if you use lean beef round instead of beef chuck, then you save a lot of points per serving. Just try to get the leanest meat you can. Enjoy! Toss beef with flour. Heat oil in a large, heavy saucepan or Dutch oven over medium-high. Heat until hot. Add the beef. Cook for 5 minutes or until browned, turning occasionally. Add tomatoes, broth, onion, pepper and thyme; bring to a boil over high heat. Reduce heat to low and cover. Simmer for 45 minutes or until the beef is just tender. Add the potatoes, green pepper, celery and carrots; return to a boil. Reduce heat and cover. Simmer for 45 minutes or until the beef and vegetables are tender.